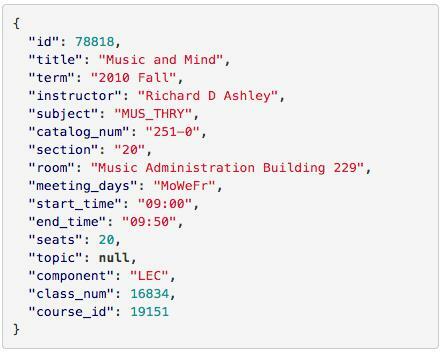 The Northwestern Course Data API gives students access to official University course data so they can create apps and programs. McCormick alumnus Sheng Wu said the idea came from seeing student developers’ frustration with using data from CAESAR. A McCormick alumnus launched a website this month that can help Northwestern students create apps using University course data. The Northwestern Course Data API, or application programming interface, launched Sept. 15 and allows students to request NU’s official course data “in a format that’s friendlier to programs than the output in CAESAR,” creator Sheng Wu (McCormick ’14) said. The data can be used to develop user-friendly apps to help students to plan class schedules. Students must log in with their Net IDs and submit a project application to be reviewed by the University before they are given access to the data. The API includes CAESAR’s ability to filter courses by categories such as subject and time. It also contains instructor information and coordinates of class locations. Wu, a former Associated Student Government technology vice president, said he noticed that CAESAR data was difficult to work with when fellow students created Courseseek, a student-developed class scheduling website that drew more than 2,000 unique visitors in a day when it went live in Spring Quarter 2013. “Working with CAESAR’s data has been an absolute nightmare,” said McCormick senior Al Johri, one of Courseseek’s developers. “I thought it would be cool to have a more official, direct way to get data that would make things much easier for student apps in the future,” Wu said. Wu, along with former ASG academic vice president Sofia Sami (Weinberg ‘14) and the Courseseek developers, approached administrators last academic year with the idea. He said they discussed the growing national trend of students using programming to solve campus problems and “how unproductive it is when universities don’t support them,” citing a Yale University incident in January when the administration shut down a student-created, user-friendly replica of the school’s online course catalog. Administrators were concerned with whether University data would remain confidential and how it would be used, Sami said, but the students eventually got NU’s support and agreed to have the administration review project applications before allowing access to the course data. ASG piloted a beta version of the API at the RedesigNU hackathon in April, a 24-hour competition that allowed students to reinvent NU web services, including CAESAR and Wildcat Connection. Sami said the API was largely planned with the hackathon in mind. Most of the project submissions at the end of the hackathon used the beta version of the API, Wu said. Now that the API has officially launched, Wu is getting in touch with the Registrar’s Office to review project applications and is looking for current students to continue working on the interface. Johri, who called the launch a “relief,” said he is also looking for students to help work on his own project. “I’m definitely looking to get Courseseek back up and running,” he said.